Is Avaaz Combatting Monsanto or Facilitating Biopiracy? Under the pretext of fighting Monsanto, Avaaz has sent millions of emails to solicit public donations to launch a global e-commerce in seeds. The French Farmers Seed Network (Réseau Semences Paysannes) asks: Do farmers need a “global online-store” for seeds? Is this commerce with seeds over the internet going to escape the laws of world trade dictated by Monsanto and other multinationals? Isn’t what Avaaz proposes running the risk of organizing biopiracy on a global scale serving these multinationals? According to Avaaz, this project is designed by “farmers who resist by preserving seeds in seed banks and barns around the world.” The Farmers Seed Network bringing together in France most organizations of “farmers” working on Farmer seeds never asked Avaaz for anything and have never heard about an organization of small farmers in the world that could conceive such a project. A few seed samples from elsewhere are sometimes enough to help them renew the diversity of their local seeds. These exchanges of small quantities of seeds are needed when farmers have lost their local seeds and also when they cope with accelerating climate change. But when they receive these seeds, farmers must first select those suitable for their own growing conditions before they can grow them on a large scale. It also happens that the local seed stocks are destroyed by a climatic catastrophe or war. Farmers must then obtain seeds from their nearest neighbors, possibly from neighboring countries, but not on a global seed market. Farmers have organized themselves to facilitate the exchanges they need despite the laws dictated by multinationals that try to prohibit them. They meet in person and talk to eachother in order to transmit the knowledge associated with each seed. If some of them are creating small artisan businesses which could seel seeds through the internet, it is always on a smal-scale level. But they don’t need all their Farmer seeds and all their knowledges to be puted up for sale on a huge internet store that would necessarily escape their control. This would only facilitate the work of multinationals seeking new seeds with intertsing traits that could be patented. They want access to farmers’ knowledge to determine which of these seeds have valuable traits worth patenting. These patents then forbid farmers to continue using the seeds, that they are invited to give for free on this “ebay store”. Providing access and information over the internet means giving Farmer seeds away to the multinationals. 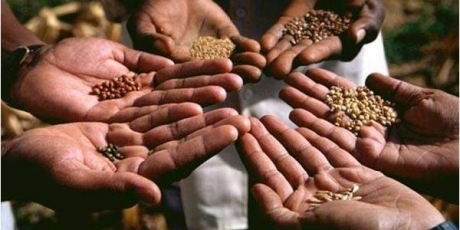 Farmers do not want to facilitate the theft of their seeds through patents by multinationals. Finally, Avaaz does not say by whom and how the money collected on behalf of farmers, who are not associated with this campaign, will be managed. Farmers are happy when NGOs help them to organize. But they don’t need NGOs trying to mobilize civil society on their behalf for purposes that are not theirs. To select and locally produce seeds, farmers need their rights to save, use, exchange and sell their seeds recognized and applied in every country. They need the mobilization of civil society to prevent in all countries of the world the laws and patents on life impeding those rights.